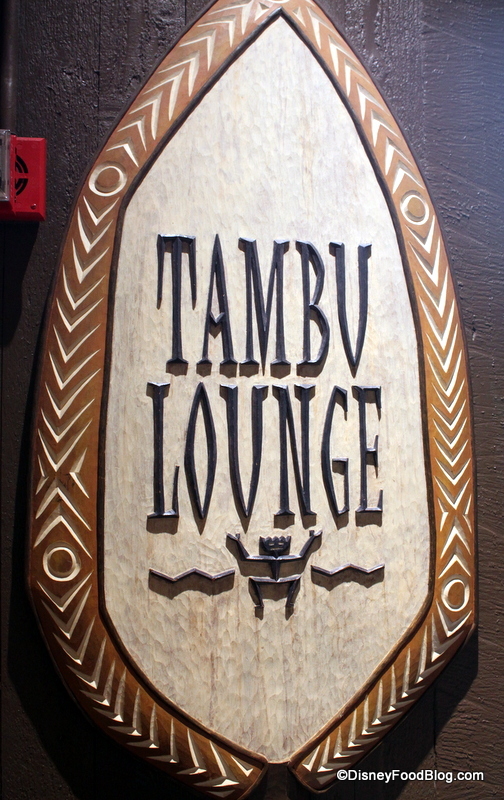 Today we’re headed to one a lounge that’s achieved cult favorite status among Disney fans in the know like you guys — The Tambu Lounge! Located at Disney’s Polynesian Resort, this is one of my favorite spots in the entire resort to kick back, relax, and enjoy an adult beverage while awaiting my table at ‘Ohana. 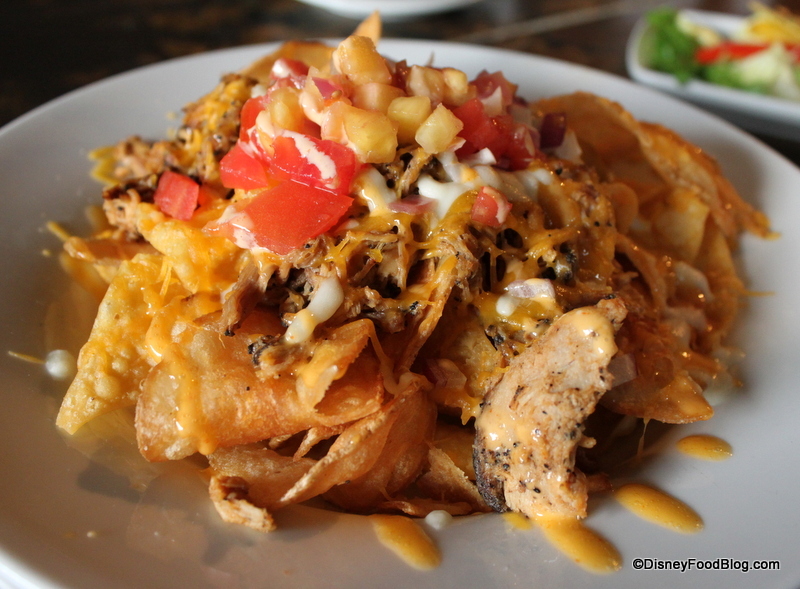 But what you might not know is that Tambu also serves up some tasty island-inspired pub grub as well. It had been a while since I’d indulged in the menu here, so when the opportunity arose (in the form of a huge impending rainstorm) I knew just the place to hide away! 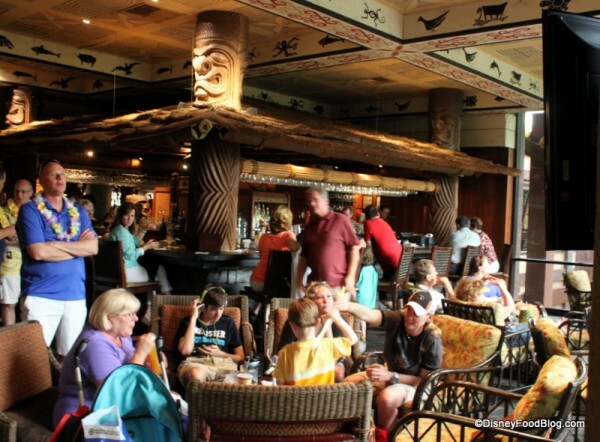 Tambu Lounge is located in the open air atrium lobby of the Polynesian Resort. It actually serves as the waiting area for Disney guest-favorite restaurant ‘Ohana, and it’s also a stone’s throw from Kona Cafe, the resort’s other table service restaurant. 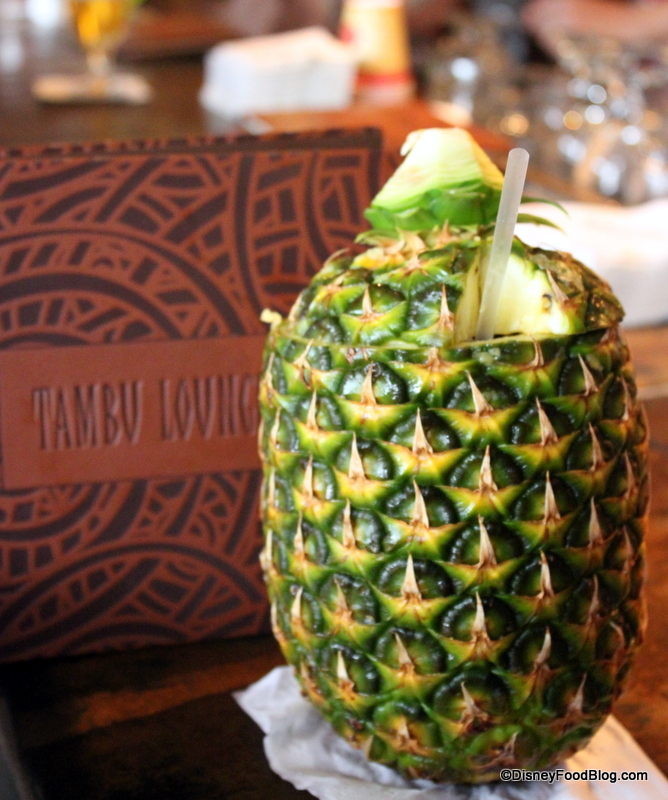 This makes Tambu the perfect place to indulge in before dinner cocktails. But I had another idea in mind. Since the space is open, the same decor that serves for the rest of the resort is found here as well. Dark walls, tikis, thatched roofs, and folk art serve to signal that you’ve traveled to Polynesia. And because this is Disney, you’ll often see guests of all ages here. The comfortable, airy lounge features floor-to-ceiling picture windows that look out on the lush garden paths of the resort, and you can just catch a glimpse of the water through the trees. If you haven’t started the relaxation process by the time you hit Tambu, this spot is likely to get you moving in the right direction. As I said before, normally Tambu is a Disney first day tradition for me. Either I’m awaiting my table at ‘Ohana, or I’m grabbing a Lapu Lapu before heading to the Polynesian’s beach to watch Wishes from my favorite spot. But today, I was all about noshing, and I couldn’t wait to check out the menu. We started, of course, by taking a look at the Specialty Drink Offerings. Although Disney has switched to a resort-wide beverage list for many of their bars and lounges, you can find some unique specialty cocktails at several of the resorts…and I’m so glad Tambu has kept several of theirs! 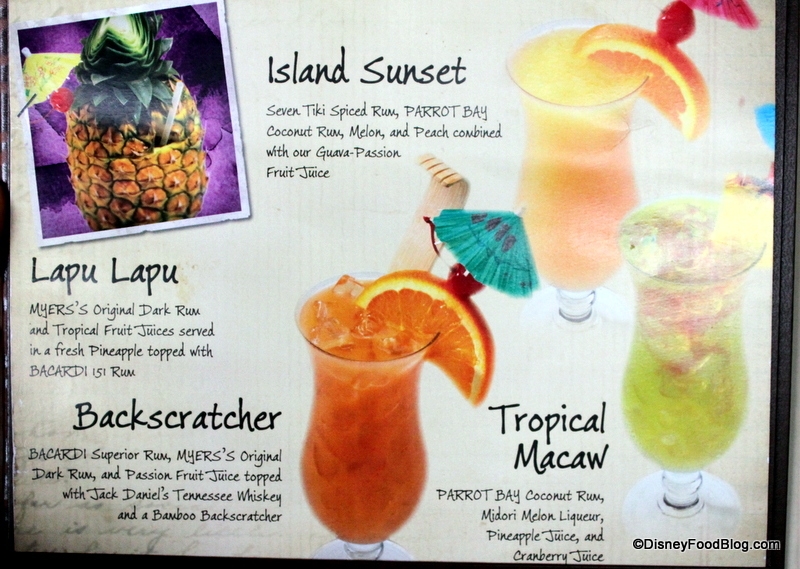 All the drinks are delicious, but nothing says “kicked back and relaxed” to me like that Lapu Lapu! This is one of my all-time favorites in Disney World. 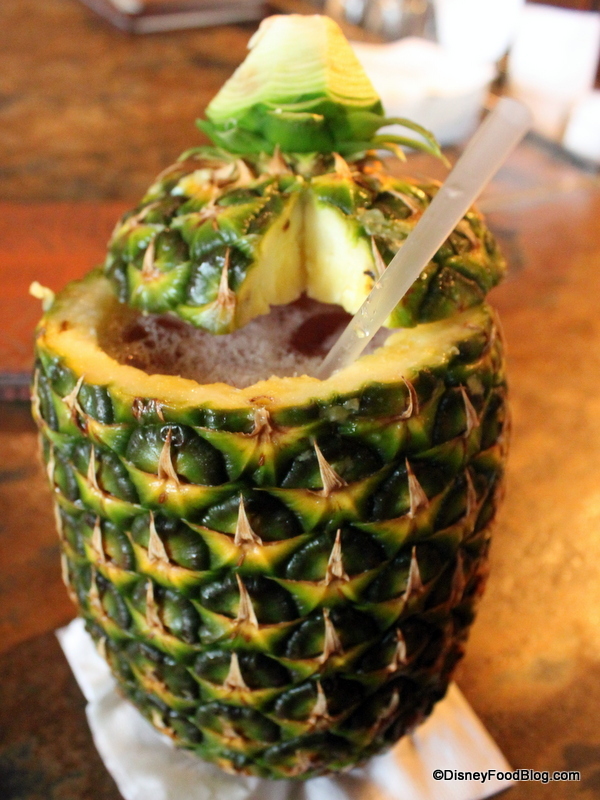 Served in a hollowed-out pineapple, it’s a delicious blend of dark rum and tropical fruit juices. In my opinion, it’s practically a rite of passage, and everyone should try it at least once (even if you don’t like rum…which I don’t)! It’s just super fun. 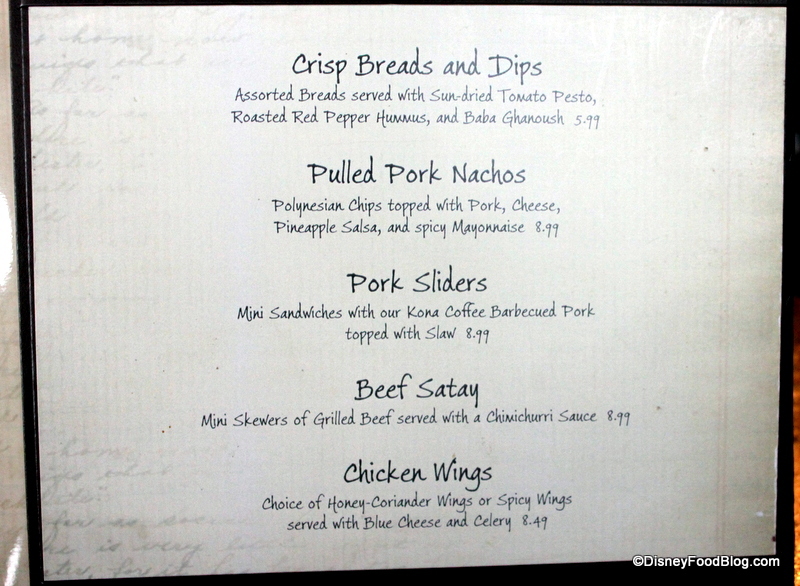 And they also can pack a wallop if you indulge on an empty stomach, so it was time to check out the Tambu Lounge Food Menu. 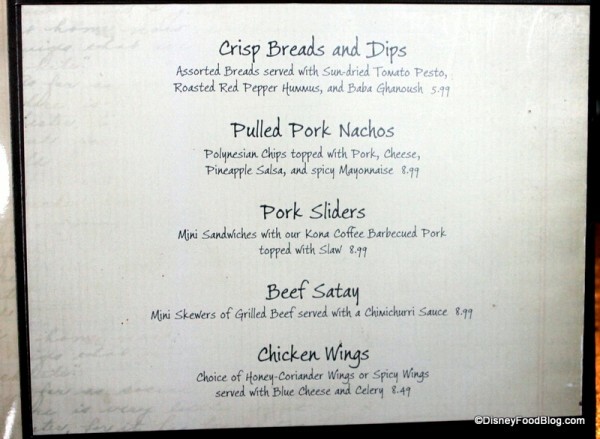 I spied a couple of items that bore resemblance to some of our favorite ‘Ohana dishes, like the Chicken Wings. There were also flavors from Captain Cook’s here, too, like the Pulled Pork items. But I’m not complaining — all of these dishes have been awesome when I’ve tried them. Since I was familiar with many of the flavors, I decided to try something a little different: the Beef Satay. 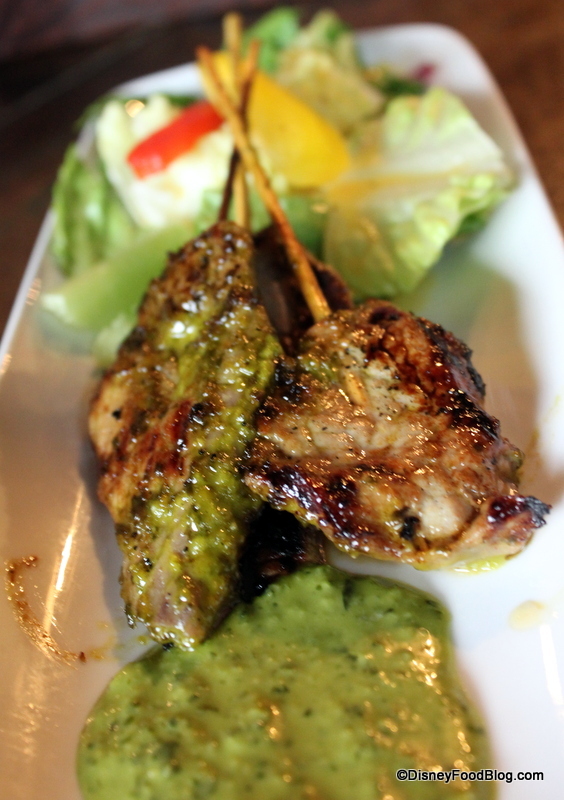 Mini skewers of grilled beef were served with a very flavorful chimichurri sauce. That may not be strictly island fare, but they were still delicious and great with the tropical drink. This reminded me of the beef skewers from the Epcot Food and Wine Festival, which are among my favorite items at the Argentina Booth. Here’s hoping they’re back for the 2013 Food and Wine Festival! 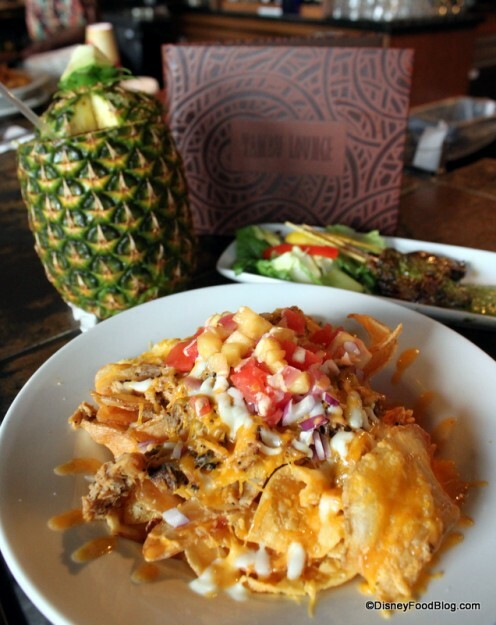 But the Pulled Pork Nachos had come highly recommended to me, and I had to try them! These are a wonderful twist on a classic bar item. They start with thick-cut housemade potato chips, and then layer on plenty of that wonderful pulled pork and cheese. Then they are topped with sweet and tangy pineapple salsa and a spicy mayonnaise. It’s a HUGE-MONGOUS dish, so bring friends to help you (or make some friends close by at the lounge!). Together with the Lapu Lapu, the dishes made for a really excellent meal. With a combination of exotic flavors, I totally dug this! Here’s my opinion: you must visit Tambu Lounge at least once. Because the Polynesian Resort is one of the original Walt Disney World resorts, opened when the park opened in 1971, there is such a strong sense of history here. Sitting in this lounge and sipping a drink from a piece of fruit is a quintessential Disney World experience. You are transported, and that’s what being at Disney is all about. It’s not just about the cocktail. It’s about that experience that you repeat until it becomes a tradition, and then it’s a part of you and your Disney memories. So pencil in some Poly time on your next visit to Disney. 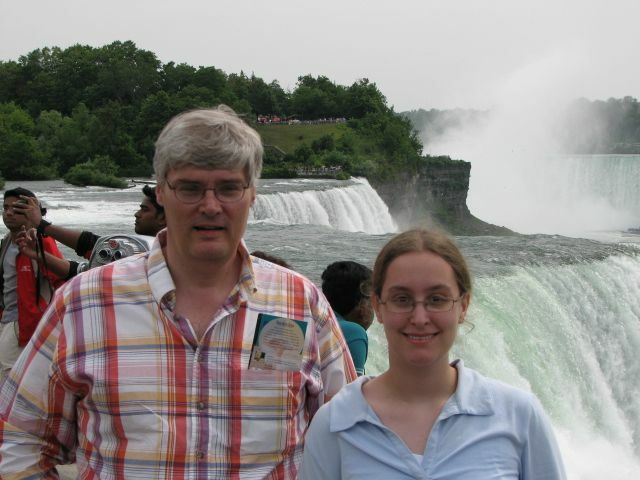 I’m confident that you’ll be glad you did. Do you have a Tambu Lounge favorite? Share with us in comments below! This entry was posted in Disney, Polynesian Resort and tagged beef satay, chimichurri, Cult Favorites, disney bar and lounge, disney resorts, Drinking Around the World, Lapu Lapu, Nachos, pulled pork nachos, Snacks, Table-Service, Tambu Lounge on June 13, 2013 by Steve.